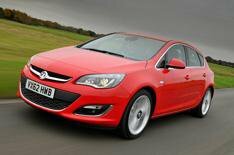 2013 Vauxhall Astra review | What Car? The Vauxhall Astra is currently the fifth-best selling car of 2012, but it's about to face an onslaught from some tough new rivals, including the Seat Leon and Skoda Octavia and VW Golf. Thats why Vauxhall has just launched this revised model, which features a number of changes to help keep the Astra competitive. Most of the changes are cosmetic. All hatchback and estate versions have a new front grille, bumpers and headlight lenses, plus additional chrome trim detailing. A new BiTurbo diesel version joins the line-up, and there are some new high-tech options, including a Driver Assistance Pack (750), which includes Forward Collision Alert, Lane-Departure Warning and Traffic Sign Recognition systems. What's the 2013 Vauxhall Astra like to drive? We drove two versions: a 1.6T SRi model which has a turbocharged 177bhp petrol engine and lowered, sports suspension and the Biturbo, which uses a 192bhp twin-turbocharged 2.0-litre diesel engine, and also features sports suspension. As before, the Astra is decent enough to drive; the SRi's suspension sharpens the handling compared with Active, Tech Line, SE and Elite versions, without making the ride too firm. Body movement is well controlled and the Astra is agile enough. However, the steering is curiously heavy around the straight-ahead, yet doesnt weight up consistently enough when you turn into a bend. The imprecise gearshift is also disappointing, although not as frustrating as the 1.6T engine. It sounds good at low revs and pulls quite hard, but mid-range acceleration is nowhere near what you'd expect from a car with 177bhp. The engine is breathless and boomy at higher revs, too. It's a similar story with the Biturbo. The engine never feels as muscular as the numbers suggest, and there isnt much urgency below 2000rpm. Whats more, the flow of power tails off dramatically towards the top of the rev range. The engine sounds decidedly clattery when pushed, too, although refinement is at pretty good elsewhere, with a bit too much wind noise at cruising speeds the only other complaint. Whats the 2013 Vauxhall Astra like inside? The Astra's cabin is unchanged, so it continues to delight and frustrate in equal measure. First impressions are good, thanks to top-quality materials and a smart design. The sports seats that come as standard in the SRi model we drove are also supportive and comfortable. The centre console falls only just short of being an ergonomic disaster, though; there are too many small, similar-looking buttons, so its tricky to find the one you want at a glance. The infotainment system (including the optional sat-nav system fitted to our test car) is overly complicated, too. Cabin space is on a par with rivals', with plenty of space for four adults and a decent boot. The majority of Astras are sold as company cars, thanks to attractive leasing rates and reasonable company car tax bills. The 1.6T petrol is nowhere near clean enough to be of any interest to company car drivers, but the Biturbo might be if youre looking for something reasonably powerful, because its CO2 output of 134g/km is far from outrageous. However, with a starting price of 24,095, your monthly tax bills won't be cheap. We'd suggest looking at the 1.7 CDTi 130 Ecoflex S/S Tech Line. CO2 emissions of just 99g/km mean this Astra falls in the lowest band of company car tax for diesel-powered cars, while performance is plenty brisk enough for most tastes. As a private buy, the Astra makes less sense. True, big discounts are available if youre prepared to haggle, but your Astra will lose a lot in depreciation during the first three years. If buying privately, our money would go on a 1.6 VVT Tech Line, which has a list price of 17,270, but a Target Price of 15,065. However, with a brilliant new Seat Leon and VW Golf just about to hit showrooms, the Astra has its work cut out.